SCERT, Chhattisgarh is also Inviting Objection for the Answer Keys. *Note: Last Date of submitting Objection/Feedback is 30-Nov 2018 by 5 PM. Official Notification for Chhattisgarh NTSE 2018-19 exam along with Offline Application form has been recently released by State Council of Educational Research & Training, Chhattisgarh. The stage-1 will be a State level offline exam for all eligible 10th appearing students. The Papers will be conducted for this exam, namely MAT (Mental Ability test) & SAT (Scholastic Aptitude Test) of 100 questions each & exam duration will be 90 minutes for both papers. The Medium for exam will be Hindi/English. All students of Class 10th from any affiliated or recognized school of state can apply for this exam. 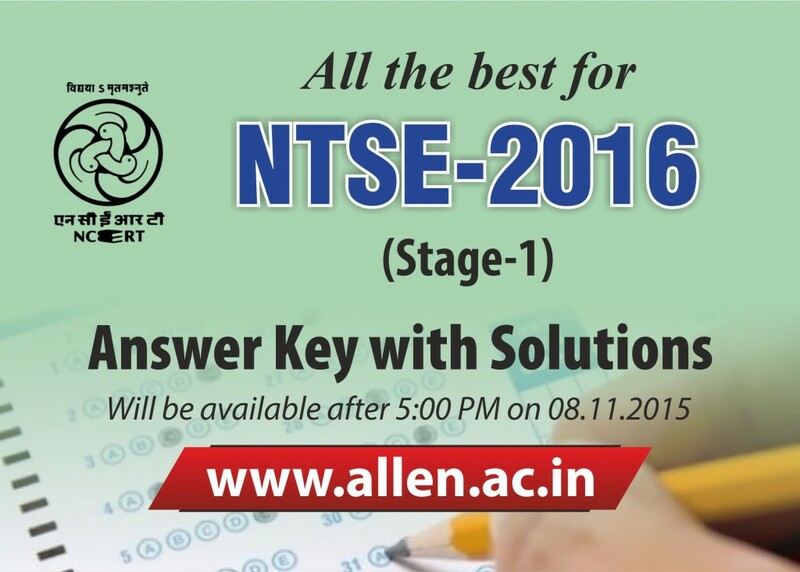 If selected in NTSE stage 1 then NCERT, Delhi will conduct NTSE stage-2 for all selected students. Students who qualify both stages will be entitled for the NCERT scholarship for class 11th, 12th, UG & PG programs (under the UGC norms). Chhattisgarh NTSE 2018 Result for Stage 1 is declared by The State Education Board of Chhattisgarh on the official website. Candidates who appeared for the NTSE 2018 exam Stage 1 conducted by all States and Union Territories on November 5, 2017 can check the result now. The State Council of Educational Research and Training (SCERT), Chhattisgarh has also announced the NTSE Chhattisgarh cut off and merit list along with result. 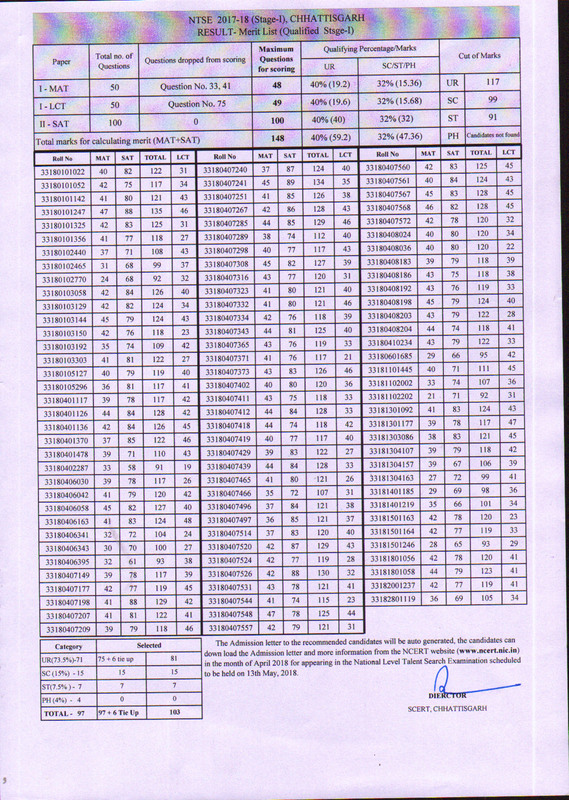 Total 103 students have qualified the exam. Candidates who have qualified stage 1 will have to appear for stage 2 of the examination which will be conducted by NCERT on May 13, 2018. SCERT Chattisgarh has released the official notification for the NTSE 2017-18 exam, scheduled to be held on 5th November 2017. Application Form also has released with the notification. Eligible candidates can submit the application forms till 31st August 2017. 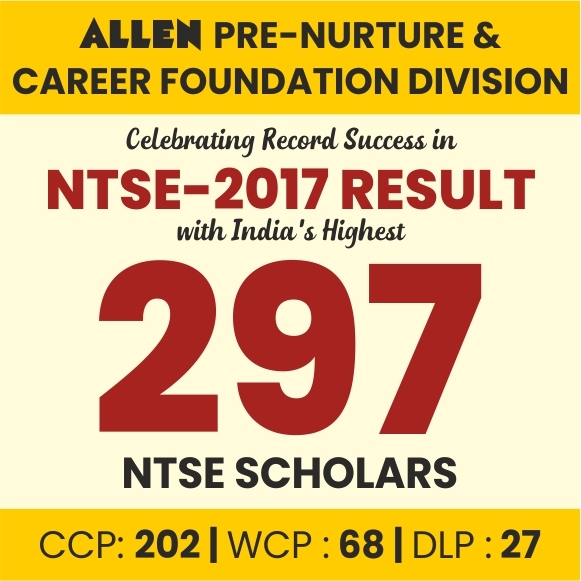 NTSE Chhattisgarh Stage 1 Result 2016-17 has been declared on 28 February 2017 for the NTSE exam conducted on 6 November 2016. Total 94 candidates have been selected for the National Talent Search Examination (Stage-II) by NCERT Delhi, held on 14th May 2017 (Sunday) this year. Selected candidates will get the Admit card directly from NCERT, Delhi at their address. SCERT Chhattisgarh, Raipur has released the Application forms for the NTSE 2016-17 stage-1 exam. Chhattisgarh NTSE Exam 2016-17 will be held on 6th November 2016 (Sunday) on the various exam centers across the state. Application Form submission last date is 31st Aug 2016. 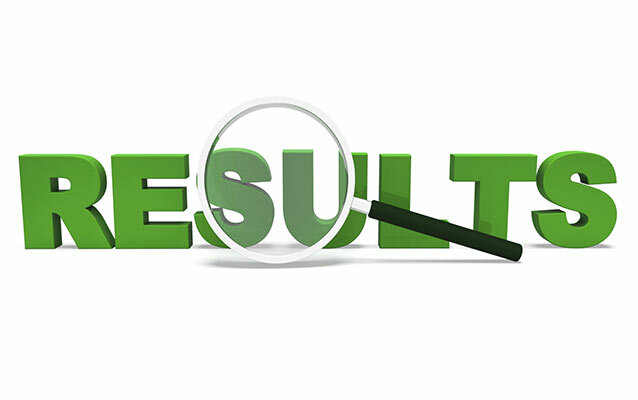 Chhattisgarh NTSE 2015-16 (Stage 1) Result has been declared on 28th January 2016 by SCERT, Chhattisgarh. Exam was conducted last year on 8th November 2015 . Total 86 students have been qualified NTSE stage 1 from Chhattisgarh. These students now eligible to appear in NTSE stage 2 exam which will be held by NCERT, Delhi on 8th May 2016 (Sunday). 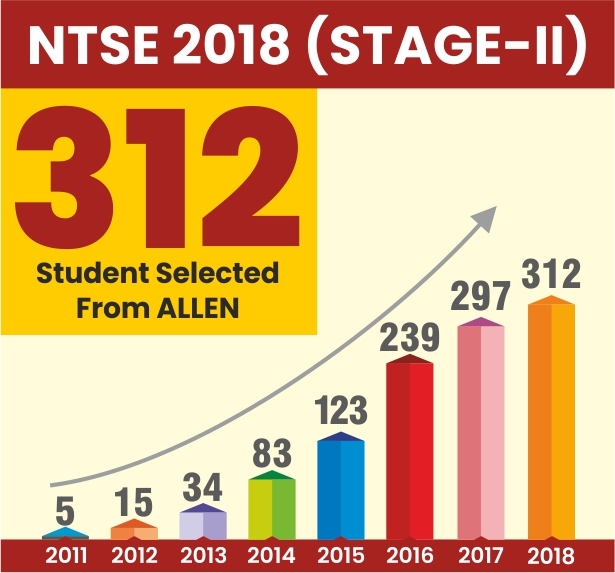 This year almost 11,000 students participated in this exam and only 86 students have qualified successfully the stage 1 exam. State Council of Educational Research & Training (SCERT), Chhattisgarh shall be conducting NTSE 2016 First Level in November, 2015. 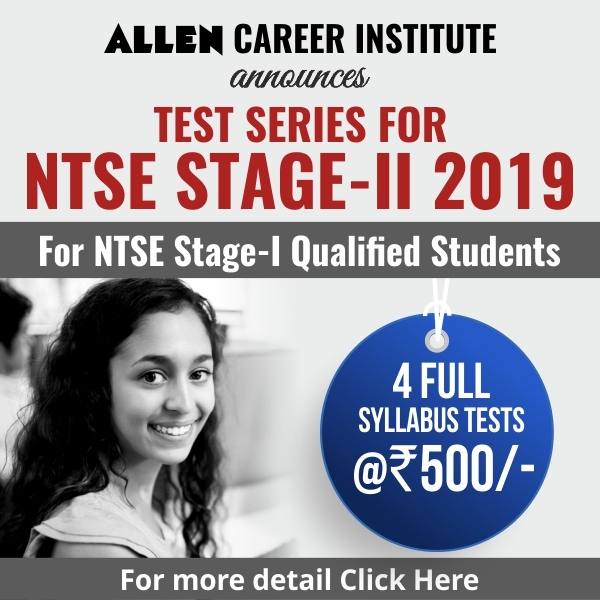 NTSE Stage I qualified students will be eligible to appear for Stage II which is to be conducted by NCERT, New Delhi. For detailed official notification please visit SCERT, Chhattisgarh website here: www.scert.cg.gov.in.